This mosaic is also at the upper south gallery on the east end, near the mosaic of Empress Zoe. It was probably made during the reign of John II Comnenus. 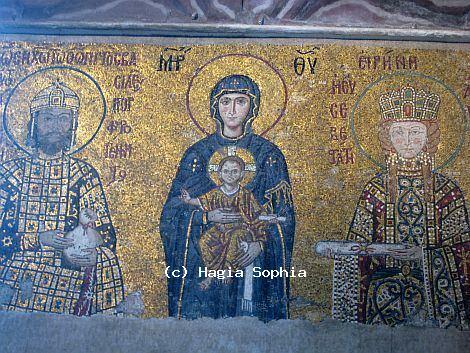 Virgin Mary stands in between the Emperor John II Comnenus and his wife Irene. She is holding child Christ. Child Christ is giving his blessings with his right hand while holding a scroll with left. Empress Irene is offering a scroll that symbolizes the donations to the church, and the Emperor is carrying a purse of gold as a symbol of donations to the church.